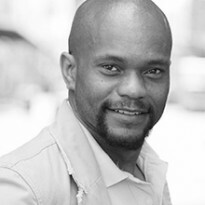 Forrest is a Tony Award® Nominee for his Broadway debut as Mr. Tambo in The Scottsboro Boys directed and choreographed by Susan Stroman, first created at the Vineyard and Guthrie Theaters. Post-Broadway, Forrest received a Barrymore Award for his reprisal of the role at the Philadelphia Theatre Company, and appeared in the award-winning London premiere at the Young Vic. Most recently, he played Gil in Colman Domingo’s Wild With Happy at Center Stage in Baltimore. Last season, Forrest played Friar Lawrence in Romeo and Juliet at the North Carolina Shakespeare Festival, followed by the title roles in Othello at the Philadelphia Shakespeare Theatre and Julius Caesar at the Lantern Theater Company. A recipient of the prestigious Lunt-Fontanne Fellowship, Forrest’s notable regional roles include a B. Iden Payne Award for the Foundling Father in The America Play at Zach Scott Theatre, and a Barrymore Award as Roscoe in Avenue X at 11th Hour Theatre Company. Forrest also teaches at the Ira Brind School of Theater at the University of the Arts and the Esther Boyer College of Music and Dance at Temple University. Recent Master Classes in London: Royal Central School of Speech and Drama, Rose Bruford College, Roger Williams University, St. Mary’s University of Minnesota. USA: NYU, Penn State Berks, Wyoming Seminary, C. V. Starr Center for the Study of the American Experience, University of Minnesota/Guthrie Theater Acting Program, Open Jar Institute, Community College of Philadelphia. Canada: Young Canadians of the Calgary Stampede.